Heathcote locals are set to experience a unique trip to the hairdressers following the opening of innovative new salon, My Hair Shed, housed within a custom-modified shipping container from Royal Wolf. 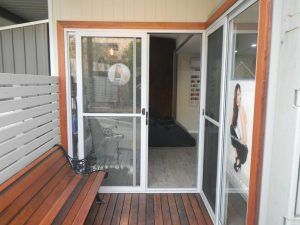 Featuring modern luxuries to ensure each client is treated to a pampering appointment, the salon is attached to the owner’s house and features an eye-catching 20 foot shipping container to form a stylish extension and homely environment. My Hair Shed owner Leah said she and her husband modified the unit to include a built-in kitchen, storage for hair care products and fresh colour on the walls. [huge_it_slider id="12"] “We wanted an extension that was not only simple to build and install, but would reflect the creative nature of my business, stand apart from a traditional salon and give clients something to talk about. I receive positive comments daily from my clients who love coming somewhere unique to get their hair done. “As a mother to a young child, having my business attached to home allows me to have the best of both worlds,” she said. Paul Hawkins, Area Manager at Royal Wolf Sydney, said innovative container constructions are being used by local businesses across a range of sectors as they can be easily modified and transported, are cost effective, strong and secure. “Royal Wolf containers are the perfect solution to a wide range of business challenges, including offices, accommodation, mobile exhibitions, retail outlets, training facilities and ground-breaking construction projects. We are constantly amazed by the different ways our customers want to use shipping containers,” he said. Royal Wolf Sydney Service Centre is located at 39 Heathcote Rd, Moorebank, New South Wales call (02) 8782 0900. About Royal Wolf: Royal Wolf Holdings Limited (ASX:RWH) is the industry leader in the hire, sale and modification of new and refurbished shipping containers, with 20 years of experience and a network of 35 facilities including 31 dedicated Customer Service Centres across Australia and New Zealand. Renowned for its focus on product innovation, Royal Wolf has taken the design and basic engineering of the traditional shipping container to new heights and today its products are used in a wide range of applications to help solve business challenges across many market sectors. The company has a customer base of over 20,000, supplying customers each year with containers which are inexpensive, safe, secure, easily transportable and able to be modified with doors, internal walls, windows, electricity, water supply and more. From portable storage options for consumers, sporting associations, community groups and schools, to accommodation units, mobile exhibitions, retail outlets, offices, kitchens, training facilities and innovative construction projects, experience shows ‘You can do anything in a Royal Wolf’. Royal Wolf containers can be specified to meet portable storage requirements for general purpose, refrigerated or hazardous goods and are available in a variety of sizes, they offer the perfect solution to many storage problems with the additional benefit of being delivered direct to your nominated site. To cater to the construction industry, Royal Wolf offers a ‘Worksite Range’ which includes a selection of shipping containers that are available as a stock item and provide hoardings and gantries, construction site offices, change rooms, first aid rooms and ablution blocks. The company also has a division focused on the freight sector, providing freight containers for road, rail, removals, bulk commodity, construction and project applications. Within this area, the business has built a particularly strong reputation amongst transport and logistics operators as a provider of specialised equipment. The mining, defence and resources sectors have embraced Royal Wolf container solutions as seen by the extensive use of large portable camps and blast resistant buildings. Royal Wolf was listed on the Australian Stock Exchange in 2011 and currently employs over 260 permanent staff who are dedicated to servicing the needs of customers and delivering container solutions.